The K&H Kitty Sill gives your pet enjoyable relaxation, with a sense of peace and tranquility, while looking out of the window. Let's face it, pets love to be looky-loos. The Kitty Sill revolutionizes the way your pet can sneak a peek while basking in the sunshine. This product has a 1-year limited warranty. 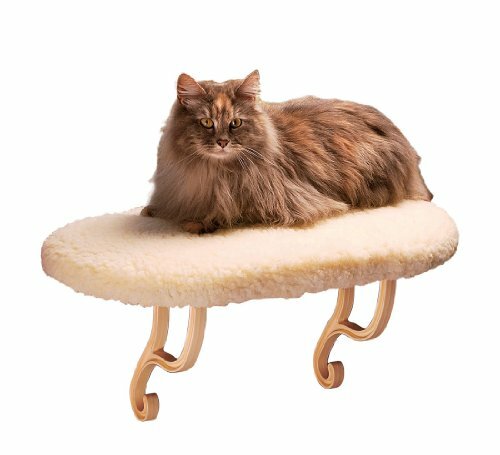 The Kitty Sill is for indoor use and accommodates even the largest of cats with its 14" x 24" size and sturdy design. This product can support up to 40 pounds. The legs are 3/4" wide and 8"from window sill to bottom of legs. There are no tools required making it practical for rental living. For a more permanent solution screws are included for attaching to your sill. It is the sturdiest window perch on the market! This product has a no-sweat easy assembly. 2"of window is needed for placement. The exquisite oval shaped design, and comfy fleece cover, will bring class to any type of home. Sleeping surface provides orthopedic support.